One of my favorite online stores “MissGuided” is having an additional 70% off on all their sales items – everything under $30. This is such an amazing opportunity to save a few bucks so of course I had to share with you all. There is always something new happening in Los Angeles. Whether it’s a new trend, a new restaurant or a new celebrity. Unless you actually live in Los Angeles (visiting on a tourist visa doesn’t count) you might not get the scoop right away. After much interest in my first “What’s hot in L.A.” post – read it here – I decided to do it again. I’m sure I am not the first person to tell you about the trend of oversized denim jackets. Due to the slight weather change in Los Angeles the denim jacket is perfect over a cute dress or a little top at night. The key to the perfect oversized 90’s look is that the denim jacket is fitted while still being oversized. For example will the sleeves fit your arm length, the shoulders will still be fitted and you avoid looking silly in your dad’s old denim jacket lol. The newest in nail design is chrome nails, whether is gold, silver, rose gold, green etc. The mirror powder is “rubbed” onto your cured gel polish and sealed with a topcoat. The color of your gel polish will determine which chrome effect/color you will get. I’ve had it once (black/silver) and I’m having withdrawals. I’m definitely getting chrome rose gold next time I’m getting my nails done. It’s been crazy the last couple of days. I’ve been doing interviews, talking to the press and a lot of meetings about my new release of “Wonderland” – watch the video here. I’ve been talking to the press from Denmark and also American media and at times it can be a little tough switching back and forth between English and Danish. I’m so used to speaking and talking about my music in English so suddenly telling about it in Danish is weird. I hate to admit it but damn brain farts have been hard to avoid. Brain farts or not it’s all very exciting and I love it. You can read my interview with the American “Rainbow Affair” magazine here and my cover story from Danish magazine/tabloid “Her & Nu” here. The photo is from one of meetings at the famous Alfred’s Coffee in West Hollywood check them to here. How I lost 15 pounds!!! Yes it’s true – over the past two years I’ve lost a lot of weight. I lost 10-15 pounds, dropped from a normal size small to a Xxs-xs. I have never been fat (TV makes you look ALOT bigger than you are so chill) but I just wanted to slim down a little and get everything tight and toned – so that’s what I did. 1. I’m not a fan of diets because I think it limits you from being social, having fun and it’ just too damn hard to stick to. Instead I primarily stick to eating proteins (all kinds of meat, fish, poultry – love turkey bacon), fruits, vegestables and I don’t mind adding rice. But I also eat chocolate every day – not entire box but a few bites. 2. If I know that I’m going out for dinner and drinks at night I try to eat very minimal during the day – No NOT starving myself. For example I’ll drink a delicious protein smoothie for breakfast and a can of tuna mixed /a piece of fish with an avocado, a bell peber and a slice of rye bread or a chicken /vegetable soup or a small salad something light and rich in proteins – you get the point. That way you don’t have to feel guilty when enjoying dinner and drinks with your friends. 3. I would never count calories – never. For me that’s a sure recipe for failure and to drive myself nuts. Just eat clean (stay away from pre-made food) and healthy. 4. If you really craving something like really crave it just eat a little bit of it instead of fighting it. For example lately I’m really into these new chips I found but instead of bringing the whole bag with me while watching TV I pour a little bit on a plate. That way I won’t eat the whole bag. 5. When you order a sandwich only eat one slice of the bread. That way it feel’s like you still had a sandwich and that you didn’t miss out. 7. Most people don’t know how to effectively work out so ask someone who does. Either ask a friend, hire a trainer for an hour or look up work out’s online. You can see all my #FitnessFriday work out videos here – get inspired or simply copy my exercises. 8. Push yourself to the limit and sweat while working out and always add exercises that gets your heart rate up such as jumping jacks, high knees, 2 minute sprint etc. 10. Don’t starve yourself. Eat till you are full and don’t be scared of eating a lot as long as it’s healthy. Dink lots of water. As much I love bread I love pasta too – but I’ve for the most parts cut it out of my diet (except special on special occasions). 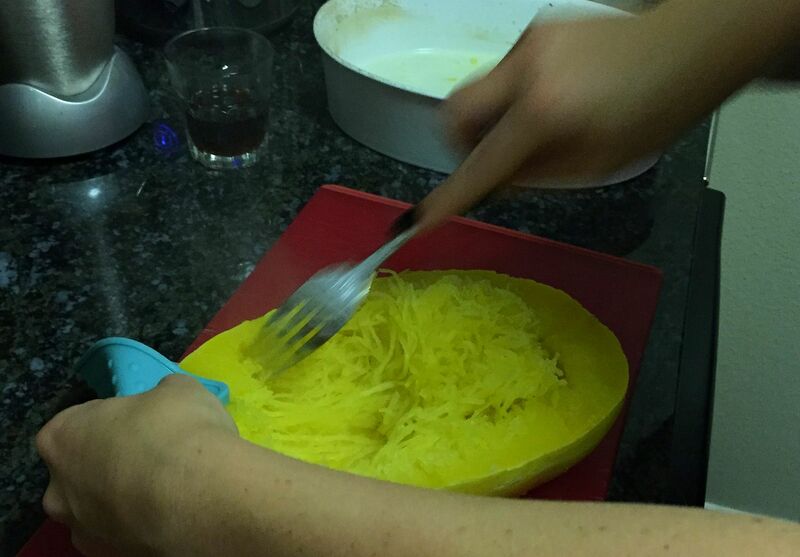 As a healthy substitute I found something new, yummy and delicious to add to my meat, poultry and fish – and that is: Spaghetti Squash! 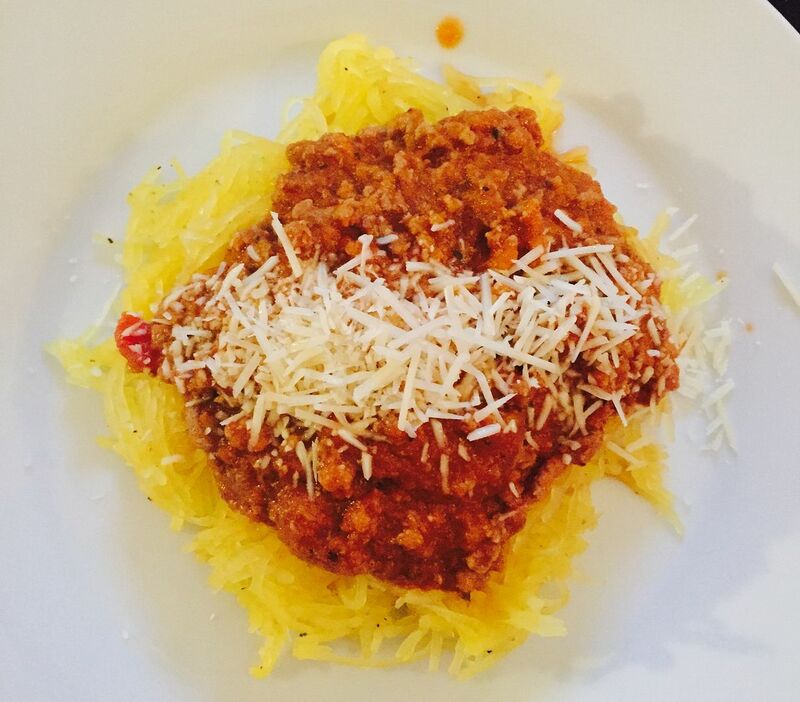 Spaghetti squash is very low on calories which makes it a perfect way to help you loose weight or stay lean. One cup of cooked spaghetti contains approximately 220 calories. 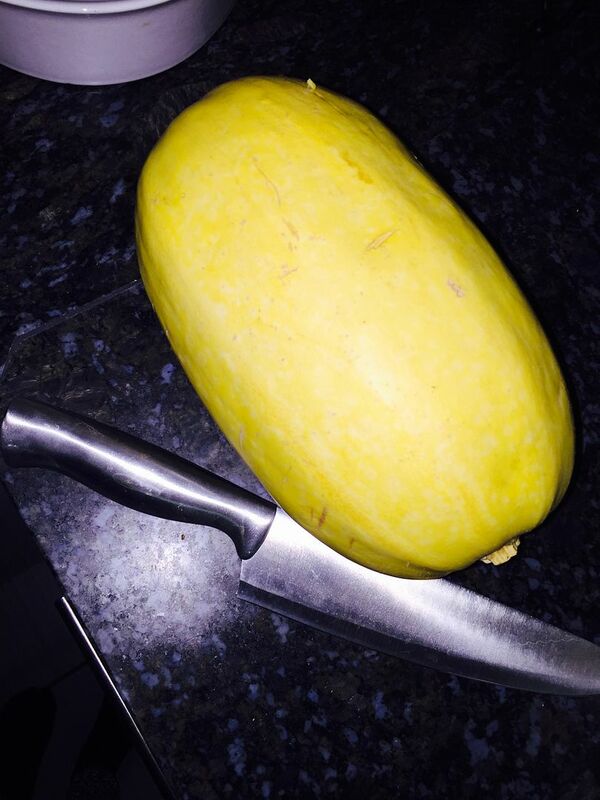 Comparably, one cup of cooked spaghetti squash is only about 42 calories. Here is my favorite fat burner! Well I know you are probably thinking how on earth is a squash going to turn into spaghetti and does it even taste like spaghetti?! Well let me take you thru the steps to eat a pasta dish without feeling bloated and guilty after finishing it – and taste aaaaamazing. 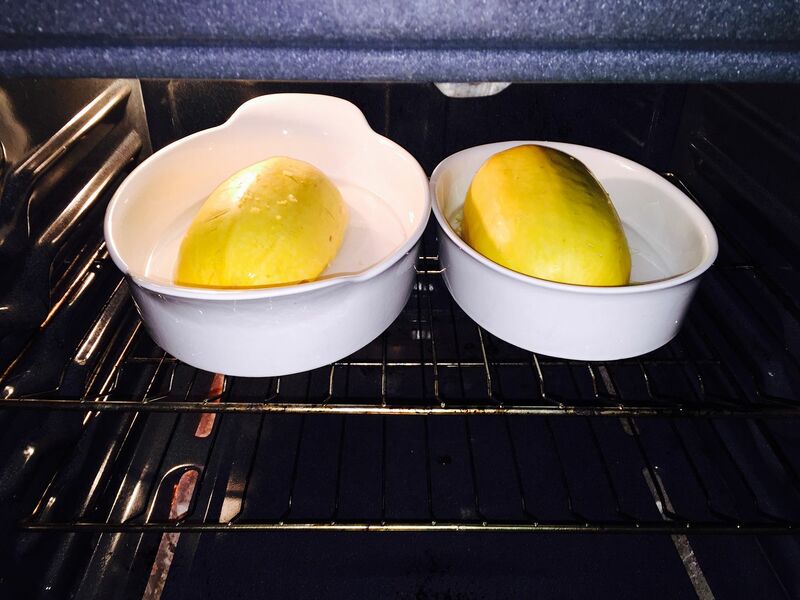 First preheat the oven to 400°F (200 Celcius)- meanwhile you prep the squash. 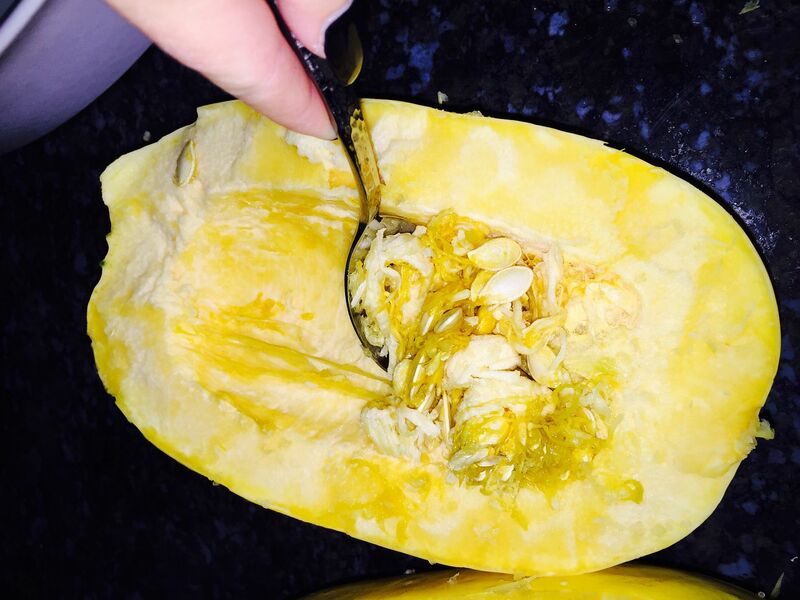 Then you take out the seeds (be careful not to take out the flesh of the squash)- I always use a spoon which makes it easier. Then place squash in a roasting pan with the cut-side facing down and pour enough water to cover the bottom of the pan. When done baking take out the squash and with a fork you are now going to scrape out the flesh. The flesh will come out looking like spaghetti. If it isn’t easy scraping out the flesh it needs to bake some more. Place the “spaghetti strings” in a bowl and add salt and pepper or other spices.